Köhler illumination is an essential technique for setting up any widefield microscope and adjusting it properly. The downloadable PDF files on the right give instructions on how to set up, and properly align, any light microscope according to Köhler’s principles of illumination. Nowadays we expect the specimen to be illuminated uniformly over the entire field of view. However, prior to the widespread use of electric light, this could be accomplished only by using a cloudy sky as the light source. This simple type of illumination is called ‘source-focused’ or ‘critical’ illumination. Electric lamps were introduced into microscopy towards the end of the 19th century, and provided a clean, reliable, intense and immediate source of illumination. They were cleaner and safer to use that oil or gas illumination, and more reliable than depending upon suitable solar illumination. However, the electric lamp filament possesses a definite structure which, if imaged onto the specimen by source-focused illumination, will interfere with interpretation of the image. In 1893 August Köhler devised the method of illumination bearing his name to circumvent this problem. A comprehensive explanation of the principles of Köhler illumination has been written by Dr. Peter Evennett, made available by permission of the Royal Microscopical Society. Download it from the sidebar on the right. There is also a related article by Dr. Evennett explaining Depth of field and Depth of Focus, and the difference between these two terms. A further information sheet that I have written on how to adjust the eyepieces correctly, after the microscope has been adjusted for Köhler illumination, is also available for download. The topic of Köhler illumination, light sources and illumination in the microscope is covered in Chapter 9 of Understanding Light Microscopy. Kohler illumination allows independent control of the illuminating and imaging ray paths. Stray non image-forming light can (largely) be excluded from the microscope, leading to improved contrast. Each individual point on the object receives light from all parts of the filament admitted by the condenser. The image of the lamp collector lens, bounded by the illuminated field diaphragm, provides a flawless field of uniform illumination. The illuminated field diaphragm acts as the control for area of illumination. 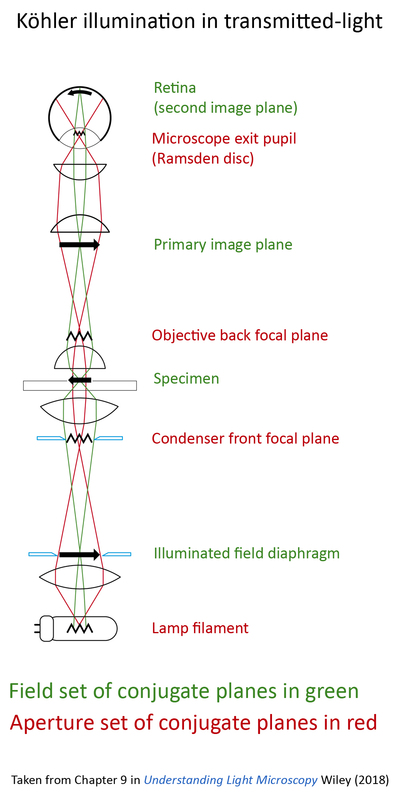 The illuminating aperture diaphragm (condenser diaphragm) controls the included angle of illumination focused by the condenser onto the object. Evennett, PJ et al (2009) Symmetrical ray diagrams of the optical pathways in light microscopes Quekett Journal of Microscopy 41/2: 109-118 – infinity-corrected microscope. This paper, Evennett et al (2009) is an update of the (2006) paper written by Hammond & Heath.